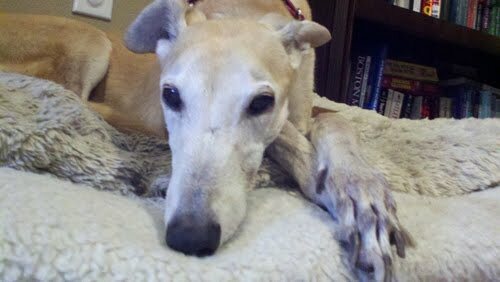 We are sad to report that one of our adopters lost a beloved hound. We got an email from Chris Ankrum last night informing us that Baby had passed on to the Rainbow Bridge. Recently she was not able to eat well and kept getting sicker and sicker. Baby and Jack (Baby’s long time companion) were Craiger’s List dogs after we took them in from a group in Pennsylvania that asked for help. At the time Baby was eleven years old. She would have been thirteen years old at the end of this month. I’ll never forget the trip to pick her and Jack up (around September 2009). I was shocked at their appearance. At the time the woman who had met me with them was brushing tons of hair off Baby. It was all over the parking lot. We loaded both dogs into my van along with several boxes of their belongings. It took me less than a minute to learn that both dogs had very rotten teeth and were very dirty. I had to drive home with the windows open. When I got them home the first thing I did was bathe them. I looked over their meager and filthy belongings and tearfully threw every single thing out. I can only imagine what their lives must have been like for so long. Baby lost another ton of hair in the week after her bath but smelled better; her fur got soft and smooth. I made vet appointments for them as they had no vet records and had not had vaccinations for over three years. Both dogs had dentals. They both lost multiple teeth. But with each day they looked better and I know they began to feel better getting those rotten teeth out. Baby was such a sweetheart, quiet and submissive. She was never any trouble at all here. We placed them on Craiger’s List. They spent some time here and it was a pleasure having them as our guests. But Chris Ankrum and his wife, Quinn, who at the time lived in Shepherdstown, West Virginia, spotted them on Craiger’s List and asked to meet them. Chris brought his other greyhound, Phinn, with him and together they decided to adopt Jack and Baby. Chris always kept in touch with us about Baby and Jack and even after they moved to Texas. It’s with a sad heart that we report that they lost Baby. But the small amount of their lives that Chris and his wife devoted to Baby comprised a huge and wonderful part of her life. Her best years, we’re sure, were with Chris and Quinn. They are our heroes. Rest in peace beautiful Baby; you were greatly loved.